Thursday night was a difficult night in Vauxhall. Although we managed to increase significantly the Liberal Democrat vote share, we still fell a long way short of victory. Here are a few reflections about this campaign which I wanted to share with you. From the beginning of this campaign I had one objective. 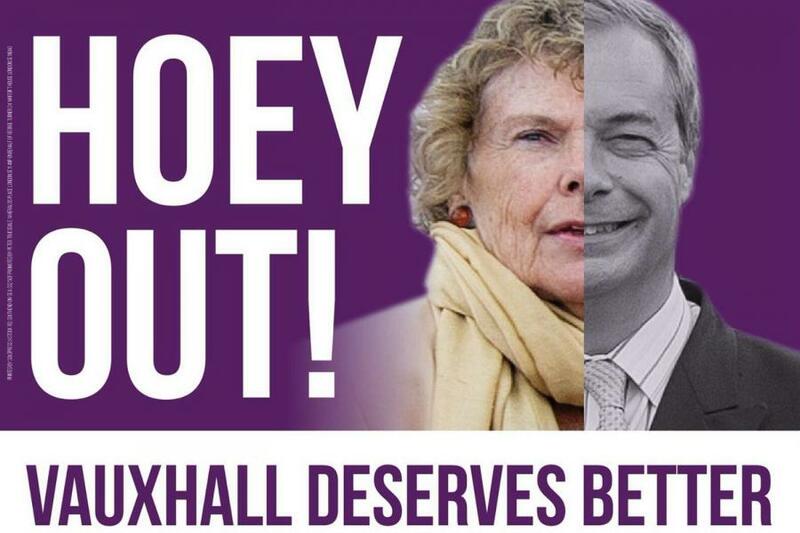 To hold Kate Hoey to account for her record on Europe and her clear and very public associations with the hard right. I wanted us to provide a voice for many people in this constituency who believed they had been seriously misrepresented by the actions of their MP. Having set out on this course we fought a powerful and relentless campaign which delivered our message with clarity and volume. The hard work in the early days and the strong message we put out inspired people from all over London to come and volunteer, many of whom had never been involved in politics before. The pressure we brought on the Hoey campaign quickly started to show. Erratic behaviour led to some bizarre incidents (who could forget the photoshop scandal). Having for years positioned herself as a straight-talking, honest politician, she showed herself to be evasive when (for the first time) she was held up to scrutiny, even going as far as to say she “wasn't on the boat with Nigel Farage”. If elections were won by campaigns alone there is no doubt that we would have stormed home to victory. In terms of activity we dominated Vauxhall. We knocked on more doors, delivered more leaflets and spoke to more people online and through the media than anyone else - by a huge margin. Everyone involved in our campaign should be hugely proud of the role they played, no matter how small. Every hour delivering leaflets, stuffing envelopes, driving, drafting text, knocking on doors or helping on polling day contributed to our collective, tremendous effort. An effort which has been widely recognised in Vauxhall and beyond. Over the last few days, so many members of the public who were not involved in the campaign told me that they thought we ran a great campaign. All of that effort had a clear impact on our result. We achieved the largest number of votes for a Lib Dem candidate in Vauxhall ever. We achieved an increase in our vote share of 13.7%, which was one of the largest increases in the country for the Lib Dems, and by far the largest in a Labour facing constituency. I am very clear we did everything we could. So with such a great campaign, backed by so many enthusiastic people, with so much positive media coverage, why did we lose? In my view the matter in the end was out of our hands. The local campaign became swamped by national politics. Having called an election, confident that they would crush the Labour Party, the Conservatives set about running the worst election campaign in living memory. They built a campaign entirely around Theresa May’s “strong and stable” leadership, which then crumbled under the glare of the TV cameras. The polls then started to swing to Labour. People started to believe that there could be a Labour government. The public, rightly tired, angry and worried about continuing austerity, saw the opportunity to reject a failing economic model that was hurting them now, and put to one side the disaster of Brexit that will hurt them tomorrow. Thousands of people were as a result motivated to turn out and vote Labour regardless of their feelings about the local candidate. That change in mood was palpable on the streets of Lambeth, it happened very late in the campaign and there was very little we could do about it. Whereas at the beginning of the campaign we were hearing over and over again the same story being repeated to us on the doorstep, “I am a lifelong Labour voter but I could never vote for Kate Hoey, so I am voting for you”, in the last few days that story changed to “I don't like Kate Hoey but I have to hold my nose and just vote Labour so we can get a Labour government”. None of this means that our campaign was pointless. At the beginning of the election period our data was showing strongly that we could win the seat. Labour clearly thought they could lose the seat right up until the close of polls. The ungracious and undignified manner in which Kate Hoey chose to celebrate her victory was a testament to that. Had the national campaign panned out differently things might have been very different, but that was out of our control. If the public was expecting a Tory landslide, the question people would have been answering at the ballot box would not be what kind of government do you want, but what kind of Brexit do you want. To that question they may well have given a different answer. I am clear that even though we did not defeat Kate Hoey, our campaign did contribute to changing politics in Lambeth – and that has to be seen as one of our biggest achievements. At the beginning of this campaign, despite having spent years advocating for Brexit with friends Farage, Fox and Davis, everywhere but Lambeth, Kate Hoey didn’t want to talk about the issue at all. She even walked out of an ITV London interview, refusing to answer questions on the issue. By the end of the campaign she was putting on her literature her support for EU citizens’ rights and signing up to the Keir Starmer plan for Brexit. This was, as we all know, a significant shift from Kate, who consistently voted against Sir Keir and with UKIP on the Article 50 Bill, including on the issue of the protection of the rights of EU citizens. For Kate Hoey, her road to Damascus was paved with Liberal Democrat leaflets. Cruel though electoral politics may be, it is not hopeless. Although in the end Brexit was not it seems in the forefront of people’s minds when they went to cast their vote on Thursday, the issue is not going away. Brexit negotiations start on the day Parliament is recalled. I remain convinced that the issue is the most important one facing our country at this time. How will we fund public services after Brexit blows a big hole in our economy? How will we be secure from terrorism if our police forces cannot share information with colleagues across Europe? How will our economy thrive, if we close off our country to scientific and academic collaborations? If you care about anything, you have to care about Brexit. In my mind, the result of the election means Brexit is more likely to end up as a disaster. The Government is now even more dependent on the hard right of the Conservative Party and have added the hard-right DUP to the mix. The Labour party remains hopelessly divided and incoherent on the issue, as was demonstrated in spades at the Lambeth count. At the Brixton Rec at 4am, Chuka Umunna and Kate Hoey made two election victory speeches that said almost the exact opposite of the other. To Umunna, his victory demonstrated that the people of Lambeth had rejected a hard Brexit. To Hoey, it was a sign that the people of Lambeth had “moved on” from Brexit. I have little confidence that this group of Labour MPs will be able to mount a credible and coherent opposition to the government on this issue. And we need an opposition badly right now. Brexit is about to become very real for the people of Britain. For the next two years there will be a relentless focus on our relations with Europe as the country starts to negotiate its exit from the EU. The chaos of Brexit, which until now has not been visible to the majority of the public, will come into full view. As a party nationally the Lib Dems must be relentless in their advocacy on Europe. We must be the voice of clarity and substance that represents the millions of people who understand that the situation we find ourselves in now is grossly damaging to our country and extremely dangerous. We must be the campaigning organisation that seeks to stop that damage from happening, that makes the case for Europe, and that will fight to secure the best ongoing relations with the European Union - whether that means persuading the government to negotiate a softer Brexit, or blocking it altogether. If we can do this successfully I am certain that in this volatile political atmosphere the Liberal Democrats will quickly see their time again. Locally, we must do what we can to hold our MP to account, to make sure she abides by the promises she made to us on Brexit in this election. and her well known associations with the DUP are a concern at the time when the DUP hold the balance of power. And whether the government holds together or not, there are local elections next year, where we must hold the Labour party to account on the council. Today, Lambeth is practically a one-party state, and that has been a disaster for the borough. As demonstrated in this campaign, which saw some supposedly “pro-European” local councillors and candidates campaign for Kate Hoey, the Labour party locally is simply too willing to put narrow party interest ahead of all else. For the good of the residents of Lambeth, that must be challenged. Politics aside, for me this has been a huge amount of fun. I have met so many wonderful people in this campaign and made many new friends. I would do it all again tomorrow. Thank you so much for all the work you put into the campaign and your donations. Without your money and your effort there would have been no campaign at all. There is no more worthy cause than challenging those that give comfort and support to the hard right. If Brexit ends up as a disaster, you can look your friends in the eye and tell them that you did what you could. Those in the Vauxhall Labour Party will not be waking up with the same feeling this morning. It is now time to take a few weeks off, recharge the batteries and get ready for the next battle. There is still a lot of work to do. I certainly intend to be involved in the fight ahead, and I hope you will join me.